Remedy is a new exhibition at ArtsWestchester, the focus of which is art and healing. This is not a new topic. In fact it has been pondered for centuries. So, we asked our newly arrived folklorist Sharna Brzycki to tell us about “Remedy and Folk Medicine.” Here’s what she had to say. Monkey gallbladders, once a prevailing facet of Chinese folk medicine, were at one point in time used to treat a wide range of afflictions — everything from liver diseases and child tantrums to an upset stomach. Centuries ago, tablets of condensed spider webs, thought to hold tremendous medicinal qualities, were used to treat malaria in various parts of the world. Today, we still see examples of unconventional treatments all over the world, from “beer spas” originating in the Czech Republic and making their way across Europe (yes, they are exactly what you would imagine them to be) to gemstone therapies, a practice in which various rocks and crystals that are believed to hold vibrational energy are placed on the body to correct imbalances. What do all of these peculiar customs have in common? Well, they are all folk remedies – and while they may seem farfetched to some, to others they are commonplace practices. Notions that originally defined my understanding of folk medicinal practices included practices like phrenology, a method of determining character and intelligence by the shape of one’s head; odd concoctions such as robin breast soup, once consumed in Newfoundland to cure tuberculosis; and mystical potions brewed by the likes of Shakespeare’s Three Witches. While my initial thoughts of “folk medicinal practices” were not necessarily incorrect, they were indeed just scratching the surface of what the term is understood to mean today. In almost all cases, there is no right or wrong answer to the question of what medicinal folk practices consist of. In fact, whether we know it or not, we all partake in some sort of alternative approach to mental or physical health, and folk remedies are more central to our lives than we tend to realize. Whorton is describing folk medicine of an alternate time, the ancestral world that too quickly defined my primary impressions. Today this definition has evolved. Folk remedies are not just elementary approaches to wellbeing with a mystical flare; and they are most definitely not limited to witch’s brew. ‘Folk remedy’ is now more broadly defined as the use of alternative mental and physical practices that are restorative and learned through hearsay or by observation. It has “expanded well beyond its preindustrial boundaries of charms and potions,” says Whorton. 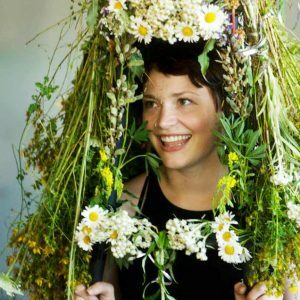 What defines these remedies as truly folk is the fact that they are learned and transmitted through personal and informal ways, as are all folk traditions–everything from Japanese flower arranging to east Galway-style fiddle playing, and all that is in-between. While a folk remedy may be used as a practical alternative to modern healthcare, it can also be used to establish and maintain cultural identity. For example, in Italy the prevailing importance of food imbeds itself into many facets of culture, even that of folk medicine. Here, numerous traditional remedies stem from the kitchen and consist of conventions such as rubbing one’s teeth with sage for whitening, treating a minor burn with olive oil, or using the root of an onion to soothe an earache. These remedies are reflective of the quintessential element of cooking and eating in Italian culture. And as long as they continue to be relayed, these remedies are capable of reinforcing Italian heritage and enmeshed traditions. Alternative medical practices are broadening and gaining popularity, perhaps in response to the growth of modern science and technology. Representations of this are everywhere. The slew of yoga studios lining the streets of downtown Manhattan and the resurgence of herbalism (the use of plants for medicinal purposes, especially in our daily health regimens) are two prominent examples. Even in our local botanica, there are folkloristic remedies to be discovered amongst the amulets and spiritual candles. As you now know, folk remedies can be found everywhere. These remedial customs, passed along from one person to another and carried through generations, are what define its meaning. You may even have customs of your own to share. What do you constitute as your folk remedy? Please let us know.